A great day of my blogging journey~~ getting the award of “THE MYSTERY BLOGGER AWARD 2018”. After the passionate blogging journey of 6 months, I have achieved my first award today. I am very much thankful to this great blogger Krishna Lakhotia to nominate me for this “THE MYSTERY BLOGGER” award. This is my first blogger award and that’s why I am so much excited to be nominated for this. Krishna Lakhotia is a great blogger and even his poetries, as well as blogs about Educational, Meditational topics, are really inspiring for other bloggers to motivate themselves. I will request every blogger and learners to follow his blogs to learn something new. You will find several types of interesting and motivational blogs to read. Thanks to Krishna Lakhotia to choose me for this award. 1. Thank whoever nominated you and include a link to their blog. 2. Tell your readers 3 things about your self. 3. Nominate 10-20 bloggers you feel deserve the award. 4. Answer the questions from the person who nominated you. 5. Ask your nominees questions of your choice with one weird or funny one. 6. Notify your nominees by commenting on their blog. 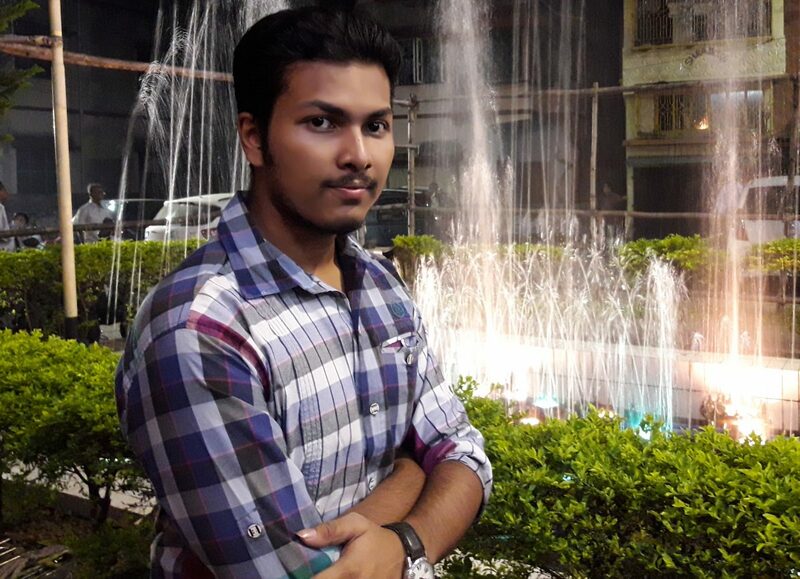 I am a simple guy from Kolkata in West Bengal, pursuing my degree in Computer Application at Netaji Subhash Engineering College under the West Bengal University of Technology. I would like to say myself a Blogaholic in a simple and short-term!! because this has become my hobby since I have joined WordPress & started blogging. Learning is fun, so I love to learn more & more and like to share my thoughts, my opinions & all of my learnings on my blog and this gives a great freedom to myself. Basically, reading is my hobby and writing is my passion, I always want to enhance my Knowledge, my thinkings by learning something new. Knowledge motivates me to the doorstep of new inspirations to do something innovative. On the other hand, I am a Hobbyist Mobile-Photographer, Tech-lover, Aspirant Entrepreneur by blogging, also trying to inspire and motivate other Internet Entrepreneurs for blogging. I have started to blogging since December 2017 and now carrying it with my passion. After creating this site, I have created my another official blog site on WordPress, named Thetechlearner which has been published officially on 2nd February 2018 & now I am going with these two blog sites simultaneously. Thetechlearner is an Educational Blogging site on Technology and Blogging/SEO. Now it gives me a greater platform to share all my knowledge and to communicate with a large number of people. Not only on WordPress, I often share my blogs and articles on Medium, Blogger, IndiBlogger, Tumblr & LinkedIn. I write on several platforms to share my blogs in the passion of writing. Ans: Though, I am a foodie person & love to eat almost every kind of dish, especially if the cook is my mom.!! but I would like to go for Chicken Biryani as my favourite dish. 2. What are your thoughts on a successful life? Ans: According to me, Success is not always to do the big things in life, but sometimes to do the small things in a greater way with a positive mind. In my opinion, the Positive mind is the primary key to achieve the success and then its need to have the fixed target with confidence, dedication, bravery to take risks, passions for hard-working with well knowledge and intelligence. There is no limit of being a successful person, all we need to do our hard works with that dedication and passion with a positive mind to have satisfaction on our success and then enhance it to reach the next steps of your goals. Keep yourself motivated and inspired to do something more unique & best and most importantly, always be honest in your work with respect and love. This is my life motto. 3. What type of blogs do you enjoy reading? Ans: I am a hobbyist blogger on Technology, blogging/SEO & kind of sharing my personal blogging experience with my audiences. So, I like to read several kinds of Tech-blogs, Blogging related case studies, SEO to learn more about my topics. Besides of these, I love to read the motivational blogs or written speeches by great persons, inspirational thoughts, poems, stories, personal or professional experiences, interviews of a successful personality (Depends on my choices). Also, other Educational blogs like on meditations, histories and other latest updates or general knowledge related blogs. Ans: As I said before, I love to learn and also now love to write my learnings to share my knowledge with my own thoughts. Blogging gives me the honorable platform to share my opinions and what I love to learn, can share through the blog with my friends & followers. It gives freedom of creativity where I can even share my ideas, feelings, experiences, my inspirations of life and so on. Blogging gives me the motivation of life too because, whenever I start writing, I can analyze my thoughts, my bits of knowledge more deeply, I can learn more things at the time of writing, it increases my power of thinkings & even I can find out more ways of my ideas by blogging. At the very first stage, I was not so familiar with writing blogs. Although I often read all kinds of my favourite topic-related blogs at online but I was not so capable to write. But when I joined WordPress & saw how other people write their posts, I got an inspiration and post a blog about myself as a first try out. I got good responses from several people and get motivated to go with it. Now I am love blogging and trying to inspire others with my experiences & opinions to motivate themselves to something new. Learning, Writing, Knowledge, Motivation & Idea is the best content for me now. My followers and regular visitors are the greatest inspiration for me to continue with my blogs. 5. What is your funniest memory (funny one)? Ans: From the very Childhood I have so many funny memories with my friends & family. Every moment in my very childhood was like a funny moment, especially with my mother. In school life, lots of funny memories I can still imagine. There is no any specific one memory to describe but every little moment of my childhood was best with a lot of funny times. So these are the nominated bloggers. What is your most favourite book which you will love to read many times? Share the best creative idea you had since you started blogging. What are your hobbies besides of blogging? What is the most inspirational thought of your life? Share your funniest experience (funny one). Thanks again to my followers and other regular visitors who read my posts and are supporting my blogs.